Learning Center - Ahoy, ye mateys! Welcome to Our Pirate Unit! The Pirate learning center is interactive for students to use throughout the whole unit when they have completed their regular assignments. 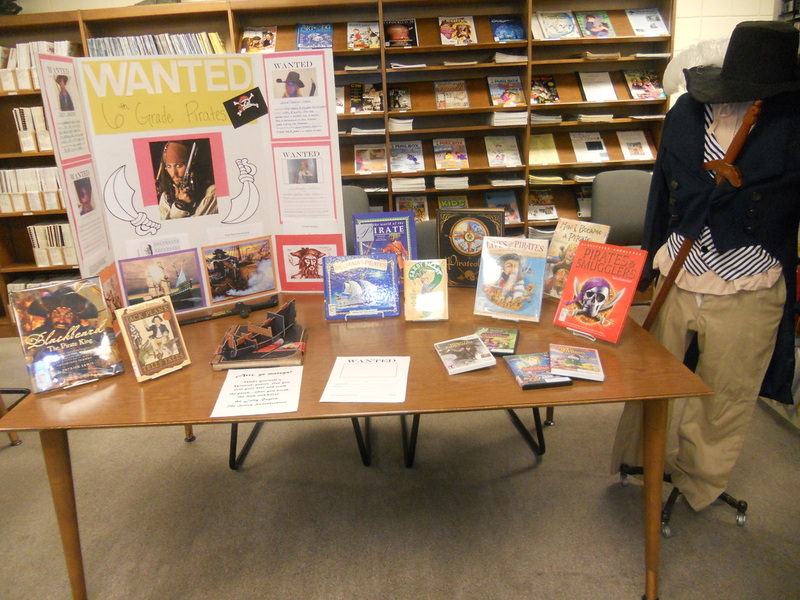 The first item that draws students to the learning center is the mannequin dressed in pirate clothing and the wanted posters of the students’ teachers. On the table there are plenty of books for the students to look through to discover new information about pirates. Also on the table there are a couple swords for the students to look at. The tri-fold itself includes five different activities for the students to participate in. These activities are just something fun for students to do. *Assortment of books on pirates can be found on works cited. The main activity for the students to complete is the wanted posters. They take one of the wanted poster templates that are available from the learning center and then they follow the directions. They draw a picture of themselves as a pirate, give themselves a name, explain why they are wanted, and give a reward for finding them. This is a fun way for students to learn about how in history there were pirates that were actually wanted. This activity is for students to complete when they have finished other assignments. The word search involves students finding words about pirate life such as: captain, bounty, and buccaneers. This worksheet is a maze that the students can do to have the pirate get back to its ship by counting by fives. This is a connect the dots worksheet, again for fun, that makes the shape of a skull. Students can draw their own pirate flag in the template available and provide a description of the flag in the lines provided on the worksheet. This activity connects to the art project that the students will do later in art class.